The charming Tuscan countryside. Il Viaggiolo is and old farmhouse which has found again its original beauty thanks to a recent and careful restoration. 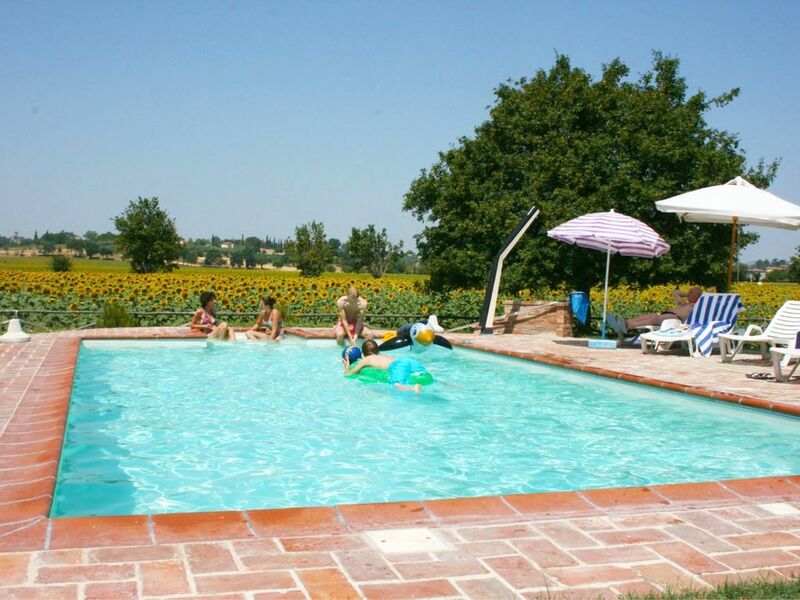 Today it is ideal to whomever wish to spend their holidays in the charming Tuscan countryside. The territory. All around the house endless cultivated fields and sweet slight hills, covered with vineyards and olive groves. Here and there ancient villages appear, rich in history and traditions. One of them is Marciano della Chiana (3 km far) dominated by its castle, where the ancient and mighty tower rises as a stern sentinel, watching the below valley. Comfort and outdoor spaces. The house is surrounded by a wide garden shadowed by forest trees and equipped with garden furniture, sun umbrella and barbecue, where also the pool (size 5 x 10 mt, depth 1,40 mt) has been built. Furnishing, nice and comfortable, perfectly fits in with the house features. GROUND FLOOR: living-dining room with kitchen corner, fireplace and single sofa bed, double bedroom with added single bed, wc (washbasin, water-closet, bidet). FIRST FLOOR: reachable either from inner or outer staircase, living-dining room with kitchen corner and fireplace, two double bedrooms, single bedroom, two bathrooms with shower. On ground floor, on the pool side, there are a bathroom with shower and a laundry. Thanks to its own characteristics (two independent entrances and two kitchens) the house is ideal to accommodate also two families who wish to spend their holidays together, yet maintaining their own privacy. EQUIPMENT: dishwasher, washing machine, Satellite TV, oven, filter coffee maker, microwave, toaster, iron and ironing board, highchair, fans (2), barbecue, covered parkings (2), Wi-Fi internet access. Das Haus ist sehr schön eingerichtet und enthält alle wichtigen Dinge, die man im Urlaub so braucht. Die Küche ist super und die Sanitäranlagen sind im einwandfreien Zustand. Große Freude bereitete uns der Pool und der große Garten. Wir hatten eine tolle Zeit und würden jederzeit wieder kommen. [English translation courtesy of Easy Reserve] The house is beautifully decorated and contains all the important things you need on holiday. The kitchen is great and the bathrooms are in perfect condition. The pool and the large garden gave us great pleasure. We had a great time and would come back anytime. very nice location, perfect pool area, friendly owner. we'll come back! Wir (je 2 Erwachsene mit einem Kind) verbrachten hier einen wundervollen Urlaub,das Haus ließ nichts zu wünschen übrig (es sei denn,man benötigt einen WLAN-Anschluß).Mit dem Vermieter verstand man sich auch ohne spachliche Kenntnisse (er nur italienisch und französisch,wir deutsch und englisch),er kam fast jeden Früh zur Poolreinigung.Da die Kinder fast die gesamte Urlaubszeit in einem Doppelbett schliefen,war das Einzelbett in der Regel unbenutzt.Man kann die Umgebung erkunden (Lage: nahe der Grenze zu Umbrien;Florenz wurde von uns mit dem Zug in ca. einer Stunde erreicht,Abfahrt in Arezzo) oder den Tag am Pool verbringen.Vielen Dank nochmal an das Vermieterehepaar. [English translation courtesy of Easy Reserve] We (2 couples each with one child) had here a wonderful holiday. The house left nothing to be desired (unless you need a wireless connection). We could well understand the owner even without linguistic knowledge (he spoke only Italian and French, we only German and English). He came almost every morning to clean the pool. As the children slept almost the entire holiday period in a double bed, the single bed was left unused. You can explore the surrounding area (location: near the border with Umbria, Florence was achieved by us by train in about an hour, exit at Arezzo) or spend the day at the pool. Thanks again to the landlord couple. nous avons passés un très bon séjour en famille dans cette belle maison très bien entretenue où rien ne manquait et sa belle piscine; propriétaires très sympathiques La région est magnifique.